We’d love your help. Let us know what’s wrong with this preview of Second Fiddle by Rosanne Parry. When 13-year-old Jody and her friends save a badly beaten Russian soldier from drowning, they put into motion a chain of events that will take them from Berlin to Paris and straight The author of Heart of a Shepherd offers another sensitive portrayal of military families, this time stationed abroad, in the city of Berlin at that historic time just after the Wall came down. To ask other readers questions about Second Fiddle, please sign up. 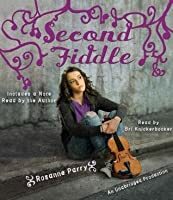 Second Fiddle by Rosanne Parry was an alluring read that had me enamored throughout. A young adult novel about three girlfriends who plan a trip to Paris for a musical competition, the story takes place in 1990 in Germany, when the wall has just come down. On their way home from a music lesson one day they witness a crime and end up saving the life of a Soviet soldier who is wanted from the government. Little did they know he'd turn their whole world upside down. They decide to help him get home Second Fiddle by Rosanne Parry was an alluring read that had me enamored throughout. A young adult novel about three girlfriends who plan a trip to Paris for a musical competition, the story takes place in 1990 in Germany, when the wall has just come down. On their way home from a music lesson one day they witness a crime and end up saving the life of a Soviet soldier who is wanted from the government. Little did they know he'd turn their whole world upside down. They decide to help him get home and take him to Paris with them. That's where the adventure starts. Where do I begin? First of all, I loved the time period of the piece and everything it represented. My mother being born and raised in Germany, I have my own particular sentiments about the wall coming down. So much history changing everyday, and we so often don't see it. Parry explained the political climate in easy and interesting description, that was fun to follow and hard to put down. I could identify well with the main character, Jody, in her plainness, or at least that's how she viewed herself. Toward the end I think she ended up having a natural beauty who's impact went unnoticed by her. You get hints throughout the story that they'll end up getting caught, but I kept thinking to myself, who cares? Can you imagine taking a trip as a teenager to a foreign country with friends and having all these adventures? You'd have memories for a lifetime. I also really enjoyed the musical/art theme that ran throughout the plot. Being involved with music most of my life, I remember well those solo and ensemble contests, and it brought back memories for me. Another aspect I enjoyed was the dusty old bookshop where they ending up staying for the night. Being an avid reader, I love when stories have little used bookstores in them. Although I did pause on wondering what Parry's intent had been when she spoke of socialism when the shop keeper offered the girls money. They didn't quite understand what socialism was and Parry left us feeling it was just about people being nice to one another. I did laugh when the shop keeper offered a book on it to the girls and they declined, saying they'd be grounded if they came home socialists. Although I appreciated the authenticity of the Karl Marx quote, I wondered at what Parry was trying to convey. Was it just another attempt at explaining the political climate of the times? Or was Parry trying to throw a little of her own beliefs in the mix? Perhaps I'm just jaded since this country has been moving more in that direction since Obama became president. In any case, the story was fantastic and I found myself tearing up at the end. Intelligent, young, girls on an adventure in Paris, following their hearts in trying to do the right thing was what it was all about. I really enjoyed it. My only thought is, I wonder how many young adults are reading this type of literature? I don't remember reading anything like this when I was a teenager, but was it because I didn't want to? Or because I just didn't come across it? I hope it was the latter and that I can raise my boys to want to ingest this kind of reading. Not only was it a beautiful story, but Parry then gave us an Author's Note at the end, telling us about the division of Germany and how it affected the surrounding countries. And it all was in an eloquent and easy to understand explanation. I know many adults my age who don't have a clue as to what the wall division between East and West Germany was really about and would love to see them read this story. What a wonderful world we live in that has literature like this for our young people. Although it doesn't have enough qualities to be considered classic literature as of yet, it was a captivating story and a delightful read. I highly recommend it. Wow, that was impressive. Parry has crafted insightful historical fiction from a period that I've read very little about, I learned so much even from the Author's note at the end. It's also a beautiful story of friendship, of heroism, of art, music, culture and creativity all threaded together in one gigantic adventure. It is set in Germany in 1990, just after the fall of the Berlin Wall. Three 13-year-old ex-pat friends are disappointed that their music teacher has to cancel their trip to perform in a competition in Paris. But when they witness the attempted murder of a Soviet soldier by his comrades they devise an extraordinary plan to try to get him to safety, which of course involves travelling to Paris and participating in the concert after all. As historical fiction the plot is rather too extraordinary to be believed, but it weaves around people, places and events that are entirely real and gives you a sense of having experienced them yourself. You understand how transitional post-wall Berlin would have felt, as well as the cultural craziness of Paris from the perspective of street musicians, fine artists and the humble writers who camp at Shakespeare and Company. There is much to talk about with young readers, from the attempted murder (due to the soldier's reluctance to do something which could harm civilians and his reporting it to the allies), to trusting strangers and how to go about trying to do the right thing. The girls keep their dangerous adventure a secret from their parents because the soldier fears that if he is handed over he will be sent back to his regiment who will attempt to kill him again. They also meet an unsavoury character at Shakespeare and Co - whom they send on his way in no uncertain terms. And after hearing the soldier talk of the brutality of Communism in his native Estonia, there is a softer view of the ideals of Socialism from the owner of Shakespeare and Co, though his motto "Be not inhospitable to strangers lest they be angels in disguise" is actually a variation on a passage from the Bible. Overall, however, there is a perfect balance between the unrealism of fiction (which takes reality that little bit further than it goes) and the truth and goodness of acting with the right intention, taking responsibility for one's actions, rising to new challenges, doing one's best to help oneself, being open to receiving help from good-hearted strangers and facing the consequences of keeping secrets from parents (especially when it involves being broadcast all over national television). I don't expect many readers would take it all literally and try to do it themselves. If we had known it would eventually involve the KGB, the French National Police, and the Supreme Allied Commander in Europe, we would have left that body in the river and called the Polizei like any normal German citizen; but we were Americans and addicted to solving other people's problems, so naturally, we got involved. Berlin in 1990: a city in transition. The Wall has just come down, people have fled from East Berlin in search of better lives, and the Soviet Army is facing some ser If we had known it would eventually involve the KGB, the French National Police, and the Supreme Allied Commander in Europe, we would have left that body in the river and called the Polizei like any normal German citizen; but we were Americans and addicted to solving other people's problems, so naturally, we got involved. Berlin in 1990: a city in transition. The Wall has just come down, people have fled from East Berlin in search of better lives, and the Soviet Army is facing some serious problems of its own. For American Army-brat Jody and her best friends, Giselle and Vivian, Berlin is also home. For a while, at least. Jody's three-year stay is about to come to an end with her family's upcoming move to Texas, while Giselle's family is headed to California. The girls are in the final days of preparing for one last competition as a string trio - in Paris! - when their teacher tells them he cannot take them after all. On their way home from receiving that disappointing news, the girls save a drowning Estonian soldier, beaten and thrown off a bridge by officers of his own Soviet Army. He needs to escape Berlin before the Russians find him. The girls need a chaperon to Paris before their parents find out their teacher canceled. What could possibly go wrong? In Parry's second book for young readers, she takes us back to a time that seems too recent to really be called historical fiction, but it is. She sketches the reality of teens of the time - no cell phones, no e-mail - with specific details without waxing overly nostalgic (an easy trap when writing historical fiction set in your own lifetime). For today's tweens, the days of the Soviet Union are ancient history! The story is told through Jody's eyes, but all three girls are strong characters. Their bond, and the way it sustains them through thick and thin, forms the core of the novel. Parry keeps their madcap antics in Paris just this side of unbelievable, giving both a thrilling adventure tale and a sweet story of friendship, loyalty, and discovering one's own strength. "If we had known it would eventually involve the KGB, the French National Police, and the Supreme Allied Commander in Europe, we would have left that body in the river and called the Polizei like an normal German citizen..."
Our narrator, Jody, is a army kid, used to moving constantly and not forming bonds that are too tight. But she's made two really good friends in Berlin at the American school--Giselle and Vivian--and the three take music lessons together. As the novel opens, Jody will soon be moving back to the States since her father is retiring from the army. In the meantime, she and her friends are preparing for a chamber music ensemble contest in Paris when their teacher falls ill and tells them he can't be their chaperone on the trip from Berlin to France. On their way home from the lesson, the girls witness a terrible crime in East Berlin, and save a Soviet soldier from drowning in the river. When they get the idea to have him impersonate their music teacher--providing them with a chaperone and getting the young Estonian away from the Russian army in one fell swoop--they can't foresee what the consequences will be, nor who exactly the young Estonian might be. Is he friend or foe? Are the Russians following them on the train to Paris, looking for the Russian sergeant? The three girls have the adventure of a lifetime in Paris, with lots of local color thrown in, including a stay at Shakespeare and Co., the famous English-language bookstore in Paris. This is an engaging story of friendship, music, and freedom set in what's a long-ago era for today's tweens--the end of the Cold War. A time before kids were constantly checking in via texting and phone with their parents--positively the Middle Ages for today's kids! An American military base in 1990s Germany is home to three friends, Jody, Giselle and Vivian, who are also in a stringed trio. The friends will be separated soon because Jody's father will be moving the family to Texas, so a final musical competition in Paris is something the girls have been looking forward to. When they have a final rehearsal at their music teacher's house, they learn their teacher,Herr Muller, won't be able to accompany them. The girls try to come up with another solution whi An American military base in 1990s Germany is home to three friends, Jody, Giselle and Vivian, who are also in a stringed trio. The friends will be separated soon because Jody's father will be moving the family to Texas, so a final musical competition in Paris is something the girls have been looking forward to. When they have a final rehearsal at their music teacher's house, they learn their teacher,Herr Muller, won't be able to accompany them. The girls try to come up with another solution while walking through an East German neighborhood when they witness two officers with red stars in a gold circle on their caps throwing a third man into the river. When the officers leave the scene, Jody goes into the river to retrieve the man with her friends' help. The man is not dead but is hurt badly and the girls learn his name is Arvo Kross, a soldier who begs the girls to hide him from his Russian unit, because he's an Estonian who went against the Russian army. Arvo convinces the girls that he must leave Berlin to be safe. The girls come up with a plan to help Arvo leave Berlin for Paris, with him posing as their music teacher especially since their parents' don't know the real Herr Muller is unable to accompany the girls. This way Arvo can be safe and the girls can compete in their last musical competition together with an adult to register them at the competition. This is my childhood! Minus the attempted murder of a foreign soldier. Loved the sense of adventure and place in this book. Had issues with the lying, but the author resolved those by the end. Jody, Giselle, and Vivian live on a military base in Germany. The three girls have one thing in common - music. They have been taking lessons from Herr Muller for years and are about to attend another competition. Their string trio has played well in the past, but this year they've practiced hard and are hoping to win. However, they will soon learn about much more than their music. While the girls have been busy practicing, history has been changing around them. It's 1990 and the Berlin Wall between East and West Germany has crumbled. The changes in Germany mean that Jody's father will be retiring and moving them back to the United States. Because of this, she is especially excited about playing with her friends for perhaps the last time. One thing Jody is not expecting is to see a young soldier thrown off a bridge. As her friends watch, she rescues the soldier, and they drag him to safety. Once he is out of danger, the girls learn his name is Arvo Kross. He explains that he is an Estonian, and that he was attempting to leave his regiment because he was being ordered to complete a dangerous mission he believed was wrong. Arvo convinces the girls that his life is in danger if he remains in Berlin, and he insists that even the Americans at the German base will not be able to help him. Jody is determined to help Arvo find a safe haven. When the girls find out their music teacher won't be able to take them to their competition in Paris as scheduled, Jody sees a chance to help Arvo. Since their parents don't know about the cancelled performance, Jody explains how they can pool their resources and help Arvo leave Berlin to seek help in Paris. Besides saving their new friend, the three girls think he will be able to act as the adult necessary to get them registered for the music competition. What follows is an exciting journey to the city of Paris. The girls do make an appearance at the competition, but that's just the beginning of their musical adventure. Jody and her friends, Giselle and Vivian, can’t believe their music teacher has to cancel their trip to Paris for a musical competition. It was supposed to be the last chance they would have to play together before Jody and Giselle leave the U.S. Army base in Berlin and return to the U.S.
Then they witness the attempted murder of a Soviet soldier by his own officers. The girls realize the only way they can truly save his life is to smuggle him out of Berlin. And that trip to Paris may be just the Jody and her friends, Giselle and Vivian, can’t believe their music teacher has to cancel their trip to Paris for a musical competition. It was supposed to be the last chance they would have to play together before Jody and Giselle leave the U.S. Army base in Berlin and return to the U.S.
Then they witness the attempted murder of a Soviet soldier by his own officers. The girls realize the only way they can truly save his life is to smuggle him out of Berlin. And that trip to Paris may be just the way to do it—if they can figure out how to pull it off. Second Fiddle by Rosanne Parry is set just after the fall of the Berlin Wall. As children of military or diplomatic parents, the girls in the story all live in homes that are highly disciplined. They’re good kids, and because they’ve moved often they know how to adapt to different environments. But Giselle and Jody are nervous about their impending move. They’re not sure they will fit in with the kids at school in the states, and they don’t want to lose their friendship in the process. Their decision to take the soldier to Paris, and the events that follow, can provide great things to discuss in a mother-daughter book club with girls aged 9 to 13. Issues to talk about include kids taking on responsibility, becoming more independent, contributing to important family decisions, and deciding whom they can trust. There’s also plenty to talk about in regards to the Soviet Union, the Berlin Wall, military family life, and visiting Paris. I highly recommend it. It's 1990 Berlin. The wall has come down but remnants of the former division are everywhere - a crumbling wall, the desolate apartments in East Berlin, the funny-looking Trabant cars and the Soviet soldiers. When Jody and her two best friends see Soviet officers attempt to murder one of their own, the three Americans act to save the wounded soldier. Learning his story, the three girls pledge not to tell their fathers and mothers serving with the American military and government in Berlin. Instea It's 1990 Berlin. The wall has come down but remnants of the former division are everywhere - a crumbling wall, the desolate apartments in East Berlin, the funny-looking Trabant cars and the Soviet soldiers. When Jody and her two best friends see Soviet officers attempt to murder one of their own, the three Americans act to save the wounded soldier. Learning his story, the three girls pledge not to tell their fathers and mothers serving with the American military and government in Berlin. Instead they resolve to help him all by themselves. Their promise will take them to Paris, where they must learn to cope with the unexpected. And they do. The powers of friendship, music and family shine strongly in this fast-paced adventure. On a personal note, this book appealed to me on another level. Like Rosanne Parry, I was in Germany in 1990, after the Berlin Wall fell, but prior to economic reunification. The familiar setting and descriptions brought back memories of a country undergoing historic change and the German people who rose to the challenge. This is the introduction to Second Fiddle by Rosanne Parry. Quite an attention grabber, right? That’s what I thought when I first heard it at the Stages on Pages event at Oblong Books back in November when Rosanne Parry read it aloud to us along with other small segments of her story. I was hooked from that moment onward and found myself both looking forward to delving into a world of music, mystery, and adventure, and once again thanking April for dragging me (albeit willingly) to another signing where I happily purchased another awesome book to add to my ever-growing book collection. Jody is a 13 year old American girl, living in Berlin with her military father and family. Together, with her two American best friends, she rescues a Russian Soldier left for dead. They scheme up a plan to help him escape and also make it to their musical competition in Paris after their music teacher had to cancel. Little did they know, their lives would be in jeopardy and they would soon have to decide if their new “friend” wasn’t the real enemy. I will be the first to admit, I am not a fan hi Jody is a 13 year old American girl, living in Berlin with her military father and family. Together, with her two American best friends, she rescues a Russian Soldier left for dead. They scheme up a plan to help him escape and also make it to their musical competition in Paris after their music teacher had to cancel. Little did they know, their lives would be in jeopardy and they would soon have to decide if their new “friend” wasn’t the real enemy. I will be the first to admit, I am not a fan historical fiction. I do love stories full of hope and heroics. Second Fiddle has plenty of that. The plot slowed considerably about two thirds the way through. For a short novel, this was somewhat detrimental to keeping my attention. Parry writes very well; but I feel the process of gathering essential timeline particulars, she veered too far off course for me. It wrapped up quite nice for a happy ending. Berlin, May 1990, six months after the fall of the Wall. Jody and her two best friends are trying to make the most of the time they have left together. The three girls, daughters of American Army soldiers, will soon be separated as Jody and Giselle’s families are moving back to the States. An upcoming music competition in Paris is supposed to be their last hurrah, but plans change after they watch a soldier get beaten and then thrown in a river by KGB soldiers. This is a wonderful story about fri Berlin, May 1990, six months after the fall of the Wall. Jody and her two best friends are trying to make the most of the time they have left together. The three girls, daughters of American Army soldiers, will soon be separated as Jody and Giselle’s families are moving back to the States. An upcoming music competition in Paris is supposed to be their last hurrah, but plans change after they watch a soldier get beaten and then thrown in a river by KGB soldiers. I thoroughly enjoyed this gentle story about being an artist/musician and finding one's place in the world (even when one is part of a constantly-moving military family), and how the former can help with the latter. Along the way the story includes an escaped Soviet soldier, KGB spies, French police, and the fall of the Berlin Wall, all of which somehow supports the story about music and home. Somehow, the story is no less gentle for all these things. I'm still thinking about that. I want to say I thoroughly enjoyed this gentle story about being an artist/musician and finding one's place in the world (even when one is part of a constantly-moving military family), and how the former can help with the latter. Okay, this would be a fantastic book to give to people who have problems getting rid of the parents. But it's historical, so the lack of cell phones, airport checks, and heightened security are not as prevalent as they would be in a more contemporary novel. Anyway, I found this surprisingly page-turning. And by "surprisingly" I mean that the cover, title, and first chapter don't really make it seem that way. I also fell in love with pretty much every character, from the grumpy cat to the kind-hear Okay, this would be a fantastic book to give to people who have problems getting rid of the parents. But it's historical, so the lack of cell phones, airport checks, and heightened security are not as prevalent as they would be in a more contemporary novel. Oh gosh, I loved this book! 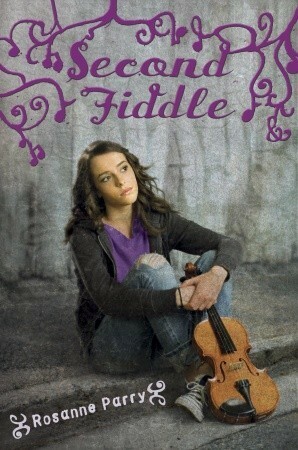 The cover seems to portray just a dreamy girl with a violin, but make no mistake - this is an adventure book! Set in 1990 Berlin, just after the fall of the Berlin wall, three girls enter a prestigious music competition, drag a dying Soviet soldier from the river, survive a train ride to Paris with the KGB after them, and while on their own in Paris, become the center of an international incident. Great fun, and an excellent read. Recommended! I loved this book, which I read as one of next year's Oregon Battle of the Books selections for middle schoolers. Though the sheer volume of their adventures may be somewhat implausible, the book is well written and draws you into the exploits of the three friends, and especially into the mind of Jody's character. The setting is a fascinating time in history, and you can't help but be drawn into the plot while you learn a bit about post-Wall Europe. Thumbs up! This book is pretty sad, but this is a pretty good story with a nice, happy ending that seems complete. It's not like a "happily ever after" ending, or a really bad ending where everyone dies, and then everything is at peace, but a good ending that seems to leave you wonder what will happen next, but not really bothering to. It's sort of like real life. As if there was an era, but it ending. Still, this book is pretty great with the plot and everything. Set in post-Berlin Wall Germany in 1990, this mystery finds a string trio of young girls witnessing a brutal attempted murder of a Soviet soldier in East Germany. Their subsequent musical adventure in Paris alone is thrilling, but the real power of the novel is in the realistic glimpse into the world of military families with their particular challenges and attributes. One Sentence Review: A historical novel (yes, the 90s are historical now) Parry cleverly balances the spy genre with a truly heartfelt tale of what it means to be an army brat when all you want is for things to stay the same. I really like the feel of this book. Historical fiction (during my lifetime - isn't that a weird feeling), adventure, European setting, military families, music, friendships that don't bicker, families that care... and writing that helps put you into it all. Historical fiction. A girl is leaving Berlin with her family as her father's new military assignment there ends. Walking along the river with her friends, they happen to see a man roughed up and hiding. I really liked this. There isn't a lot of good historical fiction in this time period. I liked all the different layers--the music competition, the problem with the soldier, the personal growth, the friendships...just an all around good novel. This is a compelling story, but even better the interaction between the three main characters feels like a very real, very valuable friendship. I'm the author of several novels for young readers, including the forthcoming LAST OF THE NAME (Ap 2019) from Learner and A WOLF CALLED WANDER (May 2019) from Greenwillow. All of my books have won awards, some of them bunches of awards, and obviously I'm proud of them all, so go look at the website for unbridled bragging. I write because I love the power of story to illuminate and uplift our world. I try to write things that are heartfelt and encourage conversation in families and classrooms. If you wanted to ask me a question or invite me to come speak at your school or library, I'd love that. When I'm not writing I try to be an advocate for literacy and libraries whenever I can. I like to read (obviously) and hike and dance and go to the beach and play the harp and write in my treehouse.